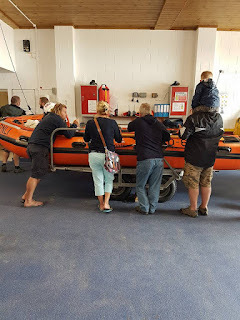 Following on from my continued communication with this Lifeboat Station, CMBC were invited to attend their Open Day at the Station. Unfortunately, there were no takers of the offer from the club, so only Myself and Andy Benfield went over. We were allowed to set our display up at the top end of the ILB garage, but making sure that no walkways or access point were blocked, as yes, the station is still on call for emergencies throughout. The station was packed with visitors all the day, we barely had time to sneak a drink. Even our club stand proved popular, especially as I finally got round to taking my Scale model of 12-26 Moira Barrie Mersey Lifeboat over for the day. The queue for the visit on board the full size boat was down the stairs, and indeed they had over 400 people take a tour of the boat, as well as visit the shop next door and of course the ILB in the garage next door along with cake stalls!